Over 100 guests attended this programme as well as the Deputy Mayor, councillor Toni Letts. Local MP Gavin Barwell was also in attendance, as well as councillors, clergy members from the Christian and Sikh Community, Chief Darren Joy, staff of the local fire brigade, members of the local police, and members of the local community who reflected all faiths in the area. The highlight of the programme was the speeches delivered by Reverend Debbie Forman, Imam Ataul Mujeeb Rashed (Missionary of the Ahmadiyya Muslim Community, serving at London’s oldest mosque in Wandsworth) and Gavin Barwell. The last of these spoke extensively about world peace, cohesion and the importance of community programmes. All three speakers addressed the concept of sacrifice as this particular Eid incorporates exactly that! This was followed by a lively question and answer session. Councillor Toni Letts also addressed the gathering and spoke eloquently on how love and sacrifice leaves an endearing mark on life and shared a story about a refugee who ultimately sent her a gift of a Holy Quran. Refreshments and a light dinner were served to the guests – and an open platform for anyone wishing to ask any questions to any of the faith or political parties present. This event was chaired by the Director of the Ahmadiyya Muslims Elders Association UK, Dr Ijaz Ur Rahman. The Ahmadiyya Muslim Community is a dynamic, fast growing international revival movement within Islam. Founded in 1889, it spans over 206 countries, with membership exceeding tens of millions. Its current headquarters is in the United Kingdom. The Ahmadiyya Muslim Community is the only Islamic organization to believe that the long-awaited Messiah has come in the person of Mirza Ghulam Ahmad(as) (1835-1908) of Qadian. Ahmad(as) claimed to be the metaphorical second coming of Jesus(as) of Nazareth and the divine guide, whose advent was foretold by the Prophet of Islam, Muhammad(sa). The Ahmadiyya Muslim Community believes that God sent Ahmad(as), like Jesus(as), to end religious wars, condemn bloodshed and reinstitute morality, justice and peace. Ahmad’s(as) advent has brought about an unprecedented era of Islamic revival. He divested Islam of fanatical beliefs and practices by vigorously championing Islam’s true and essential teachings. He also recognized the noble teachings of the great religious founders and saints, including Zoroaster(as), Abraham(as), Moses(as), Jesus(as), Krishna(as), Buddha(as), Confucius(as), Lao Tzu and Guru Nanak, and explained how such teachings converged into the one true Islam. The Ahmadiyya Muslim Community is the leading Islamic organization to categorically reject terrorism in any form. Over a century ago, Ahmad(as) emphatically declared that an aggressive “jihad by the sword” has no place in Islam. In its place, he taught his followers to wage a bloodless, intellectual “jihad of the pen” to defend Islam. To this end, Ahmad(as) penned over ninety books and tens of thousands of letters, delivered hundreds of lectures, and engaged in scores of public debates. His rigorous and rational defenses of Islam unsettled conventional Muslim thinking. 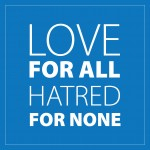 As part of its effort to revive Islam, the Ahmadiyya Muslim Community continues to spread Ahmad(as)’s teachings of moderation and restraint in the face of bitter opposition from parts of the Muslim world. Similarly, the Ahmadiyya Muslim Community is the only Islamic organization to endorse a separation of mosque and state. Over a century ago, Ahmad(as) taught his followers to protect the sanctity of both religion and government by becoming righteous souls as well as loyal citizens. He cautioned against irrational interpretations of Quranic pronouncements and misapplications of Islamic law. He continually voiced his concerns over protecting the rights of God’s creatures. Today, this community continues to be an advocate for universal human rights and protections for religious and other minorities. It champions the empowerment and education of women. Its members are among the most law-abiding, educated, and engaged Muslims in the world. The Ahmadiyya Muslim Community is the foremost Islamic organization with a central spiritual leader, known as the Khalifa of Islam. Over a century ago, Ahmad(as) reminded his followers of God’s promise to safeguard the message of Islam through khilafat (the spiritual institution of successorship to prophethood). The community believes that only spiritual successorship of Khilafat can uphold the true values of Islam and unite humanity. Five spiritual leaders have succeeded Ahmad(as) since his demise in 1908. Its fifth and current spiritual head, His Holiness the Khalifa of Islam Mirza Masroor Ahmad, resides in the United Kingdom. Under the leadership of Islamic Khilafat, the Ahmadiyya Muslim Community has now built over 16,000 mosques, over 500 schools, and over 30 hospitals. It has translated the Holy Quran into over 70 languages. It propagates the true teachings of Islam and the message of peace and tolerance through a twenty-four hour satellite television channel (MTA), the internet (alislam.org) and print (Islam International Publications). The Ahmadiyya Muslim Community has been at the forefront of worldwide disaster relief through an independent charitable organization, Humanity First. Adeel Ahmad Shah is a member of the Ahmadiyya Muslim Youth Association. Educated in Croydon, he’s now studying Modern Languages and Theology at Jamia Ahmadiyya. He enjoys working in the community here whenever he has the opportunity.